What data do we need to collect and who is responsible for entering it into the EHR? Are you collecting only the information you need or loading up on unnecessary data? Can documents be scanned into the EHR instead of manually entered? Is there duplication of effort? How many steps are involved in each process? How many staff members are involved? Can it be simplified and completed by a single person? Are you optimizing licensed/credentialed staff time? Are doctors, non-physician providers, and nurses performing tasks that a medical assistant or receptionist could handle? Make sure staff are working to the top of their credentials; providers should be limited to those tasks related to medical decision-making (ordering tests and medications, diagnosing conditions, etc.). Can the EHR simplify the process? Are you handling lab tests, referrals, and prescriptions electronically through your EHR? Can voice recognition or template-driven charting streamline documentation processes? Can secure messaging replace certain types of patient phone calls? Take advantage of built-in templates and tools in your EHR, but do so with an eye toward simplicity; too many templates complicate the decision-making process for providers, defeating their purpose. The portal can also decrease paperwork burdens, patient call volume, and administrative expense by facilitating electronic delivery of clinical records, referral and insurance forms, and template-driven health information such as lab and test results, appointment reminders, and educational and self-care materials. Demonstrate the technology in-person during the patient visit and complete enrollment when possible. Communicate the benefits to the patient (access to immunization records and lab results, for example). "Prescribe" the portal for patients with complex conditions requiring close monitoring and follow-up. Ask patients to use the portal for refill requests. If you have a dedicated refill line, repeat the request at the beginning of your recorded message. Insist that all email communications go through the patient portal for security purposes. Mobile technology also eliminates many of the workflow bottlenecks that result from inadequate hardware and workstations, another major consideration in optimizing your small practice EHR. Consult with your EHR vendor to determine optimal hardware requirements for your practice. If you are using separate EHR and billing systems, invest in an interface to integrate the two to eliminate duplicate processes and reduce billing errors resulting from manual entry. Make sure you're set up to accept credit cards for co-pays at the time of registration, and also through the portal for settling bills from home or work. Look for systems that allow patients to establish installment plans to cover larger balances; this improve your collection percentages and builds better long-term relationships by keeping accounts in-house whenever possible. A few changes in your EHR utilization and workflow can pay off in huge productivity gains. 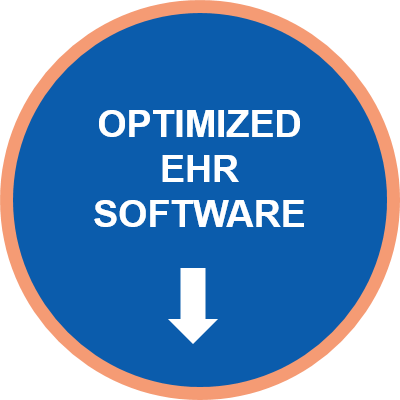 Are you optimized for success in your small practice EHR? Click below to download our free eBook on a more exhaustive list of most common snags and glitches in the implementation process and suggestions to avoid them.